System consists of 2 vertical bus bars and horizontal rows of heating elements fused to inside of rear glass. On Cherokee, power circuit to grid is protected by fuse No. 18 (25-amp) located in fuse box. Power for relay is protected by fuse No. 8 (20-amp) located in fuse box. On Grand Cherokee and Grand Wagoneer, power circuit to grid is protected by circuit breaker No. 28 (30-amp) located in fuse box. Power for relay is protected by fuse No. 19 (15-amp) located in fuse box. Fuse No. 23, located in fuse box, controls power to switch light and side mirrors. On Wrangler, power circuit to grid is protected by fuse No. 6 (25-amp) located in fuse box. Power for relay is protected by fuse No. 9 (15-amp) located in fuse box. 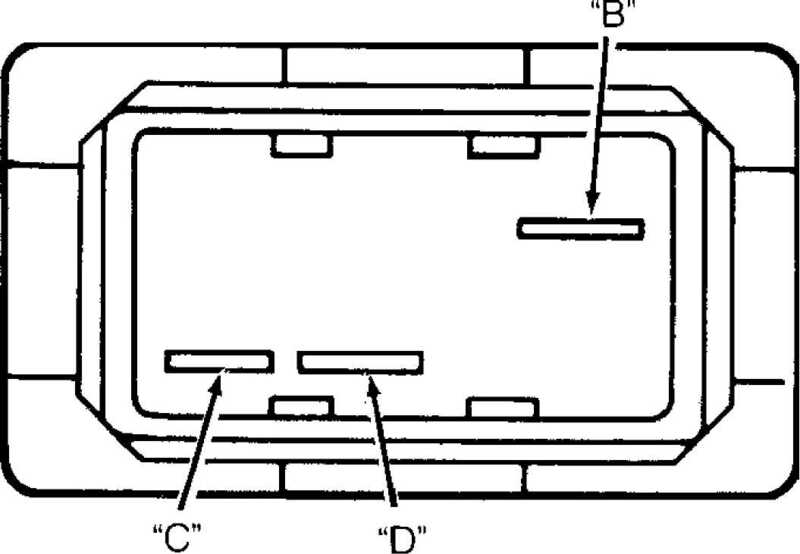 NOTE: For terminal identification, see appropriate chassis wiring in WIRING DIAGRAMS. fuses No. 19 and 23 and circuit breaker No. 28. Replace as necessary. check for an open circuit from ignition switch. present, repair open circuit from relay. Measure resistance across switch terminals "B" and "D". ohms should be present. Measure resistance across switch terminals "D"
and "C". With switch button depressed, zero ohms should be present. zero ohms should be present. apply 12 volts to switch terminal No. 1. Using another jumper wire, connect terminal No. 3 of switch to ground. If switch indicator lights, go to next step. If indicator does not light, replace switch. 2) Remove jumper wires. Connect an ohmmeter between switch terminals No. 2 and 3. Depress switch. Ohmmeter should indicate 10 ohms. If ohmmeter does not indicate 10 ohms, replace switch. If ohmmeter indicates 10 ohms, check for an open circuit between terminal No. 1 and fuse No. 23, between terminal No. 3 and ground and between relay terminals No. 2 and 3. Fig. 1: Defogger Switch Terminal ID (Cherokee & Wrangler) Courtesy of Chrysler Motors. Fig. 2: Defogger Switch Internal Component ID (Cherokee & Wrangler) Courtesy of Chrysler Motors. (Cherokee and Wrangler) or No. 5 (Grand Cherokee and Grand Wagoneer). Battery voltage should be present. If battery voltage is not present, repair open circuit to fuse No. 9 (Wrangler), fuse No. 19 (Grand Cherokee and Grand Wagoneer) or HTD/WDW fuse (Cherokee). circuit breaker No. 28 (Grand Cherokee and Grand Wagoneer). repair open circuit between relay connector and ground. present. If about 5 volts are not present, replace defogger relay. Turn defogger on. Turn ignition switch to RUN position. open circuit from defogger relay. right side of defogger grid and ground. negative voltmeter lead to ground side of vertical grid element. 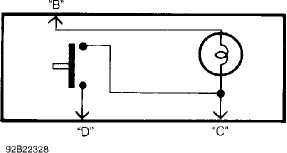 side and centerline (or positive voltmeter lead). right along grid until a sudden change in voltmeter reading occurs. That indicates the exact location of grid filament break. to be repaired inside rear window. Clean area using alcohol. 3) Carefully remove masking tape from grid line. Allow epoxy to cure 24 hours at room temperature or use a heat gun for 15 minutes. Hold gun about 10" from damaged area. Fig. 3: Repairing Defogger Grid Courtesy of Chrysler Motors. Disconnect negative battery cable. Remove instrument panel bezel. Remove switch housing panel. Disconnect switch connector. Depress switch mounting tabs, and remove switch. To install, reverse removal procedure. screws holding dash pad located behind top of center bezel. Open glove box, and remove 2 screws holding dash pad. driver’s door open, remove one screw from side of lower trim panel. Remove one screw from bottom of lower trim panel and pull panel off. Disconnect negative battery cable. Remove 6 instrument panel shroud screws. Slide shroud toward steering wheel. Remove 3 defogger switch bezel screws. Disconnect defogger switch connector. Squeeze ends of switch to release plastic retaining fingers. To install, reverse removal procedure. panel. Remove relay from connector. Removal & Installation (Grand Cherokee And Grand Wagoneer) Rear defogger relay is Red and located in relay center, in glove box. Remove relay center cover. Remove relay from connector. See appropriate chassis wiring diagram in WIRING DIAGRAMS.